Slate offers a refreshing look at the ongoing debacle. You Call That Progress? The outrageous White House report on Iraq. The White House report released today, on how far Iraq has progressed toward 18 political and military benchmarks, is a sham. According to the report, which was required by Congress, progress has been “satisfactory” on eight of the benchmarks, “unsatisfactory” on another eight, and mixed on two. 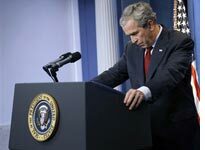 At his press conference this morning, President Bush, seeing the glass half full, pronounced the report “a cause for optimism”—and for staying on course. Yet a close look at the 25-page report reveals a far more dismal picture and a deliberately distorted assessment. The eight instances of “satisfactory” progress are not at all satisfactory by any reasonable measure—or, in some cases, they indicate a purely procedural advance. The eight “unsatisfactory” categories concern the central issues of Iraqi politics—the disputes that must be resolved if Iraq is to be a viable state and if the U.S. mission is to have the slightest chance of success. The status of former Baathists, distribution of oil revenue, local elections, disarming militias, sectarianism within the police, the legitimacy of the national army—these are the main issues grinding the parliament to a standstill, aggravating ethnic conflict, and forcing millions of Iraqis to flee the country. These are the issues that the Iraqi political leaders are supposed to be resolving while American troops fight and die to make Baghdad secure. Yet the White House is admitting that the Iraqis have made no real progress on any of these fronts. In its legislation requiring this report, Congress stated, “The United States strategy in Iraq, hereafter, shall be conditioned on the Iraqi government meeting [these 18] benchmarks.” Yet even on the eight benchmarks that it admits are not met, the White House report explicitly denies the need to change strategy. The report’s account of the eight supposedly successful benchmarks is, on inspection, no less dismaying. Or Benchmark No. 9: “Providing three trained and ready Iraqi brigades to support Baghdad operations.” The report admits, “Manning levels for deploying units continues to be of concern.” The report doesn’t explain what this means—namely, that Iraq’s brigades have only 50 percent to 75 percent of their soldiers. And yet it concludes that the Iraqi government has made “satisfactory progress” because it “has provided” the brigades. Then there’s Benchmark No. 12: “Ensuring that … the Baghdad security plan will not provide a safe haven for any outlaws, regardless of sectarian or political affiliation.” The report admits this task “remains a significant challenge” in “some parts of Baghdad.” However, it claims “satisfactory progress” because U.S. commanders report “overall satisfaction with their ability to target any and all extremist groups” and because U.S. diplomats, in their talks with Iraqi officials, “continue to stress the importance” of the topic. The good mark for Benchmark No. 17 is particularly dubious: “Allocating and spending $10 billion in Iraqi revenues for reconstruction projects, including delivery of essential services, on an equitable basis.” The report admits that the Iraqi government has spent only 22 percent of its capital budget, that “it remains unclear” whether the oil ministry has “made any real effort” to spend its share of the funds, that it’s hard to track the budget, and that the effects of new spending are felt “unevenly.” Still, it claims “satisfactory progress” because some of the revenue is dribbling into the economy. The other four “satisfactory” grades concern purely procedural matters. They assess legislation on “procedures to form semi-autonomous regions” (not on whether the regions have been formed); “establishing … political, media, economic, and service committees in support of the Baghdad Security Plan” (not whether their support has been effective); “establishing … joint security stations in neighborhoods across Baghdad” (not whether they’re effective, either); and “ensuring that the rights of minority political parties in the Iraqi legislature are protected” (not in Iraqi society). Subtle but pernicious wordplay is going on here. “Satisfactory progress” toward a benchmark is very different from “a positive trajectory … toward satisfactory accomplishment.” The congressional language requires a satisfactory degree of progress. The White House interpretation allows high marks for the slightest bit of progress—the “positive trajectory” could be an angstrom, as long as it’s “tracking toward” the goal; the degree of progress doesn’t need to be addressed. Yet even by this extraordinarily lenient standard, the White House authors could not bring themselves to give a passing grade to the Iraqi government on half of the benchmarks—and the most important benchmarks, at that. This is no academic matter. As President Bush and Gen. David Petraeus have said many times, the point of the surge and its strategy is to make Baghdad secure, so that Iraq’s political leaders have the “breathing room” to resolve their disputes. Yet if they are incapable of resolving their disputes—if they have made no measurable progress on the major issues and if the Iraqi military hasn’t advanced much either—then the surge may be a hopeless cause. Certainly, members of Congress are right to question the strategy, and Bush is deceptive in dismissing their challenges out of hand. Who’s not white hot angry about this? My blogging kindred spirit ClapSo (A View from the Bridge at ClapSotronics) remains eloquently angry, today including a Keith Olbermann video regarding a related Bush administration cesspool (Homeland Security) that shouldn’t be missed. This entry was posted on Friday, July 13th, 2007 at 3:17 pm and is filed under "War on Terrorism", Iraq occupation, musings, Politics. You can follow any responses to this entry through the RSS 2.0 feed. You can leave a response, or trackback from your own site. Travailler debout va-t-il vraiment vous faire mourir moins vite? Notre-Dame: pourquoi toujours attendre la catastrophe pour s'attaquer aux problèmes?